Better late than never, the NHTSA has finally crash tested the Tesla Model X. The Model X is often scrutinized for its widely reported build quality issues, but Tesla has a solid reputation when it comes to safety ratings. While the Model S is regarded as the safest car the National Highway Traffic Safety Administration has ever tested, the Model X has never been tested to destruction in official crash assessments, despite being on sale for two years – until now. Videos show the electric SUV getting smashed to smithereens in frontal, side and pole crash tests. Let’s just say Tesla will be celebrating the results. Perhaps unsurprisingly, the NHTSA awarded the all-electric Tesla Model X with a five-star rating in every safety category, making it the highest safety rated SUV the organization has ever tested, and the first SUV to earn the 5-star rating across the board. Occupants have a 93 per cent chance of walking away from a serious crash without serious injury. 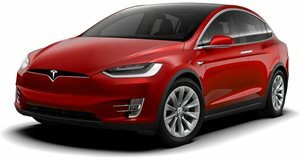 Tesla says that data from the crash tests showed that the Model X has the lowest probability of injury of any SUV, and that the overall probability of injury was second only to the Model S. A key factor of the electric SUV's glowing safety ratings is the design of its electric powertrain. Compared to gas-powered SUVs which are prone to rolling over due to their high center of gravity, the rigid battery pack powering the SUV is mounted beneath the floor. This creates a center of gravity so low, that the Model X has the lowest rollover probability of any SUV. The videos speak for themselves. There doesn't appear to be any cabin intrusion during the frontal crash test at 35 mph, and the falcon doors stay shut during the 20 mph pole crash test, despite the brutality of the impact. You don’t need the NHTSA to assure you that the Tesla Model X is the safest SUV money can buy, either – just ask the man who recently attributed the rigid design of the electric SUV for saving his life during a real-life crash.